While in preparation of his newest book and the Doctorate Course he was about to deliver, L. Ron Hubbard called together auditors for a new Professional Course. As he said, “For the first time with this class we are stepping, really, beyond the scope of the word Survival.” From that vantage point, The Command of Theta gives the technology that bridges the knowledge from 8-80 to 8-8008, and provides the first full explanation of the subject of Cause and a permanent shift of orientation in life from MEST to Theta. In the fall of 1952, L. Ron Hubbard was deep into an intense and sustained exploration of the nature, abilities and potentials of the human spirit. The discoveries were astounding. Drawing on all tools of research including the technologies of twentieth-century science, Mr. Hubbard had moved far beyond anything even conceived of by past investigators, not only identifying the actual energy of life itself, but precisely measuring the electronics of human thought. In England to establish Britain’s first professional school, he detailed these breakthroughs in a series of evening lectures, available today as Source of Life Energy. What followed was a journey of adventure, step by step and breakthrough by breakthrough, into a wholly new and uncharted realm. 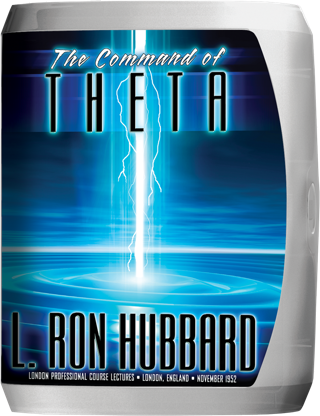 Encompassing everything from Dianetics: The Modern Science of Mental Health to Scientology 8-80, here was an introduction to the universe of theta itself. And whereas these revelations crossed a new frontier of discovery, they also formed the prelude to all L. Ron Hubbard would unveil the following month in the Philadelphia Doctorate Course. Indeed, he was concurrently at work on a new book, Scientology 8-8008, whose aim embodied the central theme of all he taught during these London lectures: to reduce the importance and seriousness of the MEST universe and its authority and to increase the ability to build and create a universe of one’s own.